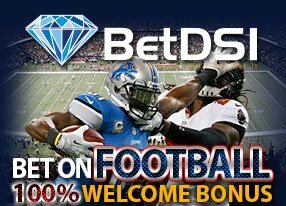 Established in 1998, BetDSI has spent the last 18 years building an exceptional sports betting reputation in the industry. With a great variety of not only sports betting products, but also horse racing, casino and poker options, BetDSI proves to be a sportsbook you need to consider. BetDSI offers a wide variety of sports to wager on, including all major US and international sports. For fun, they offer odds and betting options on major entertainment, political, and world events. BetDSI is excellent in fast grading of games to ensure players can use their winnings quickly if they so choose. It also boasts 24/7 live online chat support and phone service for members, meaning any wager can be made and any question can be answered at any time. In particular, their history has demonstrated a business that sets the odds in the betting marketplace ensuring early and sharp lines, providing the best and earliest wagering opportunities for intermediate bettors. BetDSI includes a great casino offering, poker room, racebook, office pools and free contests as well. For the average bettor, the site offers industry-leading sports stats, matchup and trend data and more as research materials and an always-improving site design and layout. Sitting on the solid Digital Gaming technology platform and headquartered in Costa Rica where it is licensed as a gaming operator, the site is as safe as it gets in the online gaming industry. BetDSI claims customers in 140 countries and offers services in several languages and dozens of currencies. BetDSI definitely thrives when it comes to mobile betting. The mobile site uses the same four-step process that we used while placing bets on a computer. In fact, this is the one sportsbook where it may actually be easier to place a bet through your smartphone than on the actual web site. Get updated odds throughout entire sporting and specialty market events on all Major Sports. Bet every play of your favorite sport!